Was the Russian lawyer who met with Donald Trump Jr., Jared Kushner and Paul Manafort in June of last year the first evidence of possible Trump campaign collusion with Russia -- or was she part of a sinister Democratic plot to entrap the Trump campaign? Over the past three days, members of the pro-Trump media have settled on their answer, characterizing the lawyer, Natalia Veselnitskaya, as a leftist with ties to the Obama administration. The idea quickly drifted upward to some of the most influential figures in right-wing media, and then ultimately to President Trump himself, who referenced some of its underpinnings during a Thursday press conference in France as he attempted to explain away his son's meeting with the Russian lawyer. The theory is based on bits of fact that have been taken out of context or spun in misleading ways to paint a picture that the President and his supporters prefer to the one currently dominating much of the media. The narrative appears to be untrue, but in some ways that's beside the point. The pro-Trump media has employed a consistent strategy when responding to damaging reports about the President and his allies, one it will likely continue to use should more revelations concerning Russian interference in the election emerge. Instead of covering those revelations, pro-Trump media outlets often turn to entirely new stories or controversies. 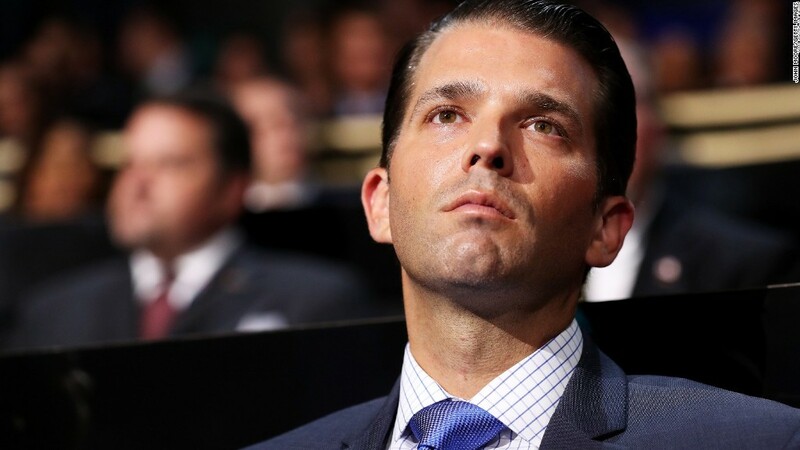 Any factual problems or logical holes -- in this case, that it would make little sense for Democrats to have entrapped Trump Jr. before the election only to hold on to the damaging information for almost a year after Election Day -- don't matter so long as these alternative narratives last long enough to confuse audiences during otherwise bad news cycles. "All that right-wing media needs to do is just throw out some things that appear to be substantive that have some stray facts that the cult will hang on to, and the cult will do everything else themselves," John Ziegler, a conservative media columnist and former talk radio host, told CNN. "They don't need a full theory. No one ever provides a narrative that explains all this. It's just poking holes and pretending the whole story is fake news. It's a classic trick really. It's a shame that's what the right-wing media has been reduced to." This week's theory was given its first sparks of life on Monday, when Mark Corallo, a spokesman for President Trump's outside counsel, pointed to Veselnitskaya's loose ties to the firm that produced the infamous Russia dossier -- that firm had worked for a law firm which represented a company for which Veslnitskaya worked -- and suggested they were relevant to discussions of Trump Jr.'s meeting with her. Soon after, Trump supporters discovered and began to circulate a photo on Twitter of Vesenlitskaya with Michael McFaul, who was US Ambassador to Russia under President Obama. 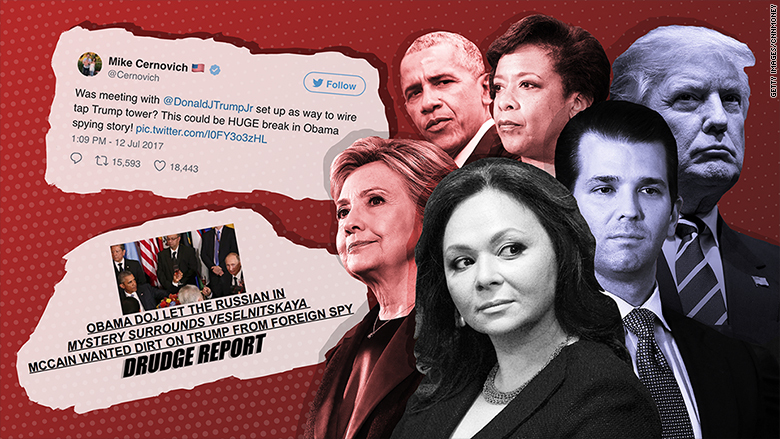 The image was picked up by the Gateway Pundit, a far-right website, which characterized the picture as evidence of Veselnitskaya "hanging out with Obama officials just days after her meeting with Donald Trump Jr." Hours later, far-right Internet personality Mike Cernovich posted a video on Twitter in which he used the photo, in part, to ask whether Veselnitskaya was a "Democratic plant" who was sent to "wire tap Trump Tower." That video had been retweeted more than 15,000 times as of Friday afternoon. But the story really grew legs when it landed on the Drudge Report, which often acts as the de-facto assignment editor for right-leaning media. The website linked to the Gateway Pundit's post, giving it the headline, "PICTURED WITH OBAMA AMBASSADOR TO RUSSIA." On Wednesday, conservative talk radio king Rush Limbaugh told his national audience that he believed Veselnitskaya was part of a "setup" targeting Trump. Fox News host Sean Hannity also questioned on his radio show why Veselnitskaya was seen pictured with McFaul, telling his audience there was a picture of the two "in existence," as if it was damning evidence. But the truth, which those discussing the photo typically either played down or ignored altogether, was more innocent. The photo of McFaul and Veselnitskaya did not show the two "hanging out" with each other -- it's of a Congressional hearing, open to the public, at which McFaul testified. Veselnitskaya was sitting in the audience, in the row behind McFaul. McFaul told CNN this week that he had no control over who attended or where they were seated, that he had never met with Veselnitskaya and that he only learned her name this week. "It's ridiculous," McFaul said. "It's silly. And I think it shows the desperation in a world where facts don't matter. That's the part that bothers me as an academic and American. Basic facts don't seem to matter in these debates." The photo of the hearing was not the only image cited as supposed evidence as the theory grew in popularity. Trump supporters online also pointed to a photo Veselnitskaya posted to Facebook, of Arizona Sen. John McCain, a Republican who's been critical of Trump, with a Russian opposition lawyer, claiming it was proof she'd been inside McCain's office. That was not the case. In a press release warning of "fake news," McCain said the assertion was false and that Veselnitskaya "did not attend that meeting." She had only for whatever reason posted the image of him and the lawyer to her Facebook page, McCain said. But the theory got its biggest boost Wednesday night, with a story published by The Hill. The Hill reported that Veselnitskaya got into the U.S. only because the Department of Justice under President Barack Obama and led by Attorney General Loretta Lynch let her in after she'd been previously denied a travel visa. The report, which was co-written by John Solomon -- a journalist fresh off stints in conservative-leaning media, who has recently written a number of articles favorable to the narratives of Trump supporters -- said in its second paragraph that "it was the Obama Justice Department that enabled the newest and most intriguing figure in the Russia-Trump investigation to enter the country without a visa." It was only in its 16th paragraph that the article explained why she had been let in: to help a company owned by a client defend itself in federal court. This latest piece of news jolted through the pro-Trump media system. Drudge blared a pair of banner headlines on his website. A post on the popular pro-Trump sub-Reddit "The Donald" held it up as evidence she had been confirmed as an "OBAMA PLANT." Fox News splashed a lead story on its homepage under a headline claiming the former attorney general "LYNCH PINNED Trump." Finally, on Thursday afternoon, the conspiracy theory reached its apex. Trump, speaking at a press conference in France, invoked elements of it, appearing to reference the photo of Veselnitskaya and McFaul at the Congressional hearing that had made its way through Gateway Pundit, Cernovich, Drudge, Limbaugh, Hannity and others, as well as The Hill's story. "Now the lawyer that went to the meeting, I see that she was in the halls of Congress," Trump said. "Somebody said that her visa or her passport to come into the country was approved by Attorney General Lynch. Now maybe that's wrong. I just heard that a little while ago, but I was a little surprised to hear that. So she was there because of Lynch." Following Trump's comments, a spokesperson for Lynch said in a statement provided to CNN that the former attorney general had "no personal knowledge" of the Russian lawyer's travel. The spokesperson explained that the "State Department issues visas, and the Department of Homeland Security oversees entry to the United States at airports." Lynch wasn't the only one to push back against suggestions she was part of a larger plot to frame the Trump campaign. In a text message to CNN, Veselnitskaya responded to a question asking whether she had been working with the Clinton camp to entrap the Trump campaign. "Yes, of course!" she wrote in a tongue-in-cheek message on Thursday. "And with Hugo Chavez and Kim Jong-un." --CNN's Emma Burrows contributed reporting.